I have myself a Mondo card! Having used it for a week, I thought it worth reporting a bit about it, and what they seem to be trying to do. 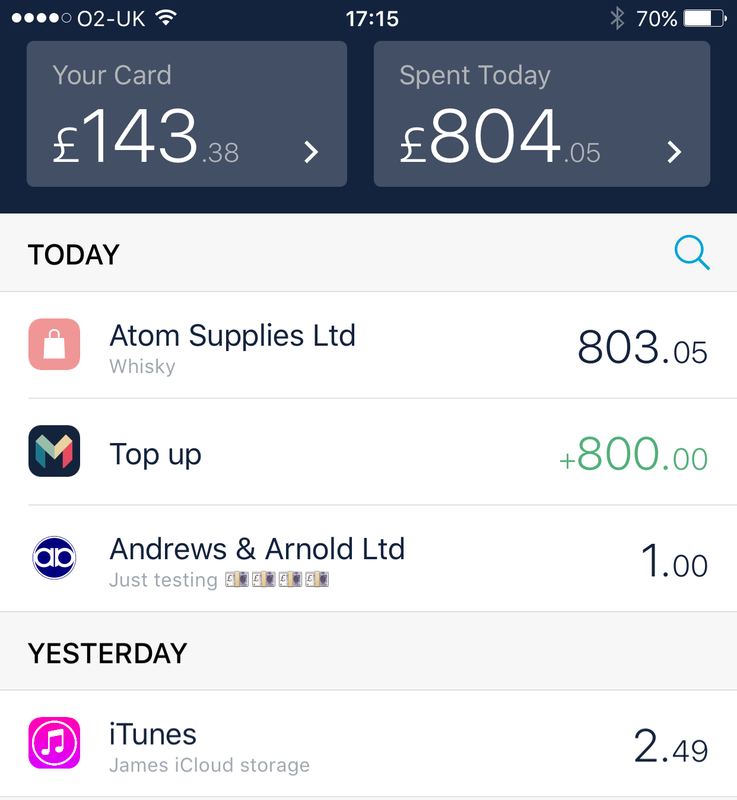 Firstly, where it is now is basically a pre-pay MasterCard with a good API and App. This is actually a useful thing for certain people that seem unable to manage their money, want the convenience of a card rather than cash, but need to have a hard limit on spending, no overdraft, and a really clear idea of where the money is going. I can see it really being a heck of a cash alternative for a lot of people right now. Where they want to get to is being a full bank, and the attitude seems right so far. The App is based on a published API, so you can program your own interface to it. Once it has BACS and fast payment stuff in and out, it will be actually quite useful even for business use. I'd love to be able to pick up incoming fast payment instantly at the company. The other good news is that, as they are testing, they are taking feedback and suggestions and making changes, so there is a good chance we can make this a bank I would want to use. It is still early days, but interesting. Anyway, looking at it now, it is worth explaining a few things that I have found so far. I have the app on an iPhone and it is very nice. Transactions show instantly, and I mean instantly - we did tests at the office charging me £1, and my phone was going "ka-ching" and showing the transaction as we hit the button to charge the card! You can freeze and unfreeze the card from the app! Great if you misplace it. You can tag the transaction with notes that show on the main "feed"/statement screen. You can advise the correct company name, twitter, Facebook, website for the company on a transaction, and they pick up the logo from twitter once the check it out - so even A&A have a logo on Mondo, yay! They show declined transactions, and why declined (like expiry date wrong), which is brilliant! Getting a card - you sign up and are advised of place in the queue, and you can refer other people to get bumped up queue. No checking on referral emails, so owning a wildcard domain is fun. What is slightly odd is that you cannot do anything referring a friend once you have a card - it is not putting them top of queue for example, only referring before you are top of queue yourself, or so it seems to me. You do need £100 to start. Oh, and the cards are a horrid, very fluorescent, pink/orange colour. Victoria loves it! Anyway, the kids are all getting them. Failing to manage money seems to run in the family, and this will help, I am sure. I did note a card refund is slow - but I think that is the way cards work - auth is quick, credit is like two working days. The other fun thing was my mobile number. As you may know I have an 01344 number on my mobile which breaks lots of systems, including Barclays, but Mondo accepted it. Then they could not text it. So I had to borrow a number to get the set up and PIN texts. The good news is that I then got them to correct it with no hassle (impossible on Barclays, I tried many times). Now people can send me money from a Mondo card using my (01344) mobile as the reference and it arrives (instantly). So well done on that! P.S. I like how they do not use the usual red=-ve, black=+ve, but green=+ve and black=-ve colour scheme. P.P.S. As commented on twitter, thank you: "Pre-paid card with an app — looks good. Not credit card so no s75 CCA 1974 protection for, say, big whisky purchases"
P.P.P.S. The Whisky will be here tomorrow (Friday)! FYI the Amex iPhone app has a similar instantaneous notification of transactions (which was very unexpected given the general quality level of banking apps). My phone often vibrates in my pocket before the card terminal says "transaction approved". I was saying to Alex today that it is a sad state of affairs that any of us are impressed by this - technology can do this - we are impressed any banking system can! I've always been impressed by Amex's services: apart from not being accepted by certain greedier operations because of the slightly higher processing fees, it's the closest I've yet found to what a card issuer should be. Instant notification, helpful and competent support people (I had a duplicate transaction submitted by a wonky WHSmith POS living up to both interpretations of its acronym)... The instant freeze/unfreeze facility in Revolut and Mondo would be nice, though. I'd actually forgotten about signing up for Mondo - apparently, I've already reached the front of the queue, so my card's on its way now. 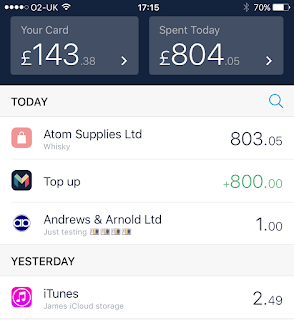 Revolut also appears pretty much instantly within the APP but it doesn't look quite as polished as that one, mind you theirs is aimed at foreign currencies more so than being a replacement for your bank card. One thing I really desire is a digital receipt whenever I make a payment. A quick search turns up "commerce eXtensible Markup Language" which could perhaps be used or adapted to allow for a standard interchange between retailer and merchant. That colour scheme's going to be confusing for around 5% of the population if they have other bank accounts with conventional colours.